Air Pressure Pump Drain Opener Unclogs Toilets Sinks! DRAIN BUSTER is safe and strong! This unique power pump is engineered with sturdy plastic that will not fail under pressure but will get the tough jobs done. Great for home or office - works for sinks and commodes! No chemicals to damage your skin or clothing. Much more effective than an old fashion plunger. 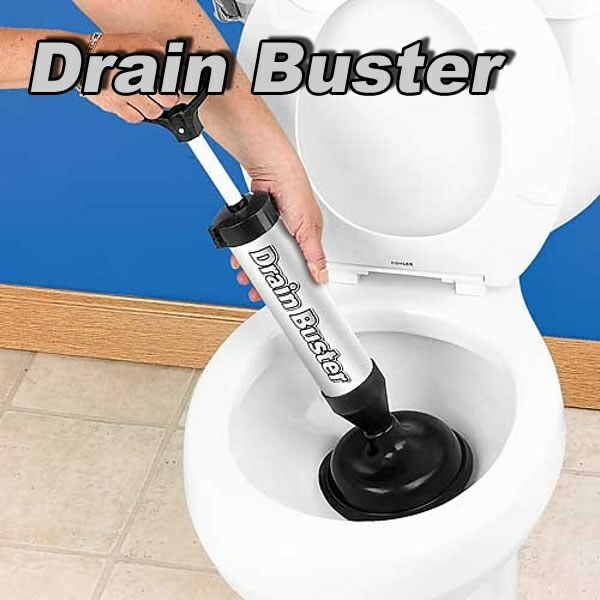 Love this item, truly the best plunger on the market, it handles and plugged toilet, and also swap out the connector and use it on a sink (bathroom, laundry, or kitchen as long as no garbage disposal), worth the money! Great tool to have when the toilet 0r sink gets backed up.